Long time readers of this blog know that I have been critical of the annual Board retreats, not so much because of what was discussed as much as what wasn't. Namely the long-term economic outlook. I felt this year was different. After the routine matters were quickly dealt with Thursday evening, the rest of that session was devoted to discussing economics. I described to the group my "Four Knobs" approach to looking at fiscal structure - which is that once you set the goal for three of the four parameters: spending growth rate, cash reserves, levy size and levy interval - the fourth is determined. I suggested that the first 'stake in the ground' should be the interval to the next levy - and that it should be at least three years. There seemed to be general agreement that this was a good target. No doubt, some will say that any more levies are too much. Others will demand evidence of "cutting the waste" be presented before any levy gets their yes vote. We'll hear about school buses that always seem empty, or lights left on at the football fields when no one is there, and how we have too many highly paid administrators. In truth, what we have is a school district which has evolved - from the very good, smallish and rather ordinary school district which was Scioto Darby Local Schools back when we moved here over 30 years ago - into a school district which is among the 10 largest in Ohio, offering a rich array of programming and services, and which excels in academics, performing arts, and athletics. We are one of a handful of the 600+ school districts in Ohio which has been rated by the State Board of Education as "Excellent with Distinction" three years in a row. Attached to every one of those programs and services - added incrementally over many years - is a constituency. Also attached is an expense stream. We know that nearly 90% of our operating budget is spent on compensation and benefits. That's because every program and service is provided by a person. Or a team of people. Good people. Talented and experienced people. The catalyst for Hilliard's rapid growth was the strife created by the Penick vs. Columbus Board of Education lawsuit in the late 1970s, which ended with the Federal court ordering the implementation of busing to achieve racial integration of the Columbus City Schools (a failed effort), which in turn motivated many families to seek housing in the suburban school districts. The suburban building boom started in the late 1980s, when the economy began heating up, and most of us were feeling pretty good about the economic future. And so the student population of our schools boomed as well. Prior to 1988, the last new school building opened in our district was Britton Elementary in 1968 (which was being used as a "Freshman Building" when we moved here). Then in the period between 1989 and 2002, we constructed 13 new school buildings - a rate of one per year. Each of those new buildings required a new team of teachers, staff and administrators. Many were teachers just beginning their careers, and consequently at the bottom of the pay schedules. Those who were hired during this period of rapid expansion are now 20 or more years into their careers, and consequently are in the upper half of the pay grid, where there are no step increases. This is approximately 35% of the teachers. Let's pause to recognize what the new collective bargaining agreements means to these folks: their last pay increase was January 2010, and they won't get another one any earlier than January 2014 (what happens after this contract expires is yet to be determined). In other words, our most experienced employees - the ones who were instrumental in building this District into what it is today - will have their pay frozen for four years, and by the way will also be making a slightly larger contribution to their health insurance coverage, about $60 more/mo for family coverage. So our compensation costs have risen at the rate they have over the past 20 years largely because we have a huge body of employees who were hired young and have been since steadily marching through a fairly aggressive step schedule accompanied - until the last year - by 3+% base pay increases. If our growth period as a district is over, then we could enter a time of much slower compensation growth as more teachers and staff advance past the years when step increases are applied. Our average compensation would still be much higher than it was 20 years ago, but the year to year changes would be expected to be smaller. Having smaller growth in compensation costs ties right back to the Four Knobs. That is, if the rate of compensation cost growth slows, it would allow for less frequent and/or smaller levies going forward. Andy Teater made an important observation in this regard: that if many of our most senior teachers accept the early retirement incentive offer that was part of the most recent contract, then the teachers we hire to replace them will receive much lower pay (about half) than the senior teachers, but they'll also be receiving step increases for a number of years. A school district with a stable population tends to also reach a stable cost of labor. The number of teachers and other staff remains relatively constant, as does the distribution by length of service. In that circumstance, the year to year change in personnel costs is likely to be driven as much by rising health insurance costs than salary increases. At this moment in time, we are not a rapidly growing district, but we still have thousands of acres of developable land within our boundaries, including most of the land surrounding Bradley High School. If and when the market for new homes takes off again, we'll again become a high growth district -- if our school district remains desirable. And remember, that if we aren't a place where people want to built new homes, we won't be a place where people want to buy our existing homes either. Low demand = low selling prices. Not good. The decisions we - Board and Community alike - make over the next four months will set the tone for the future of our school District. The Board seems to be in agreement that we want to aim for at least three years before asking for another levy. 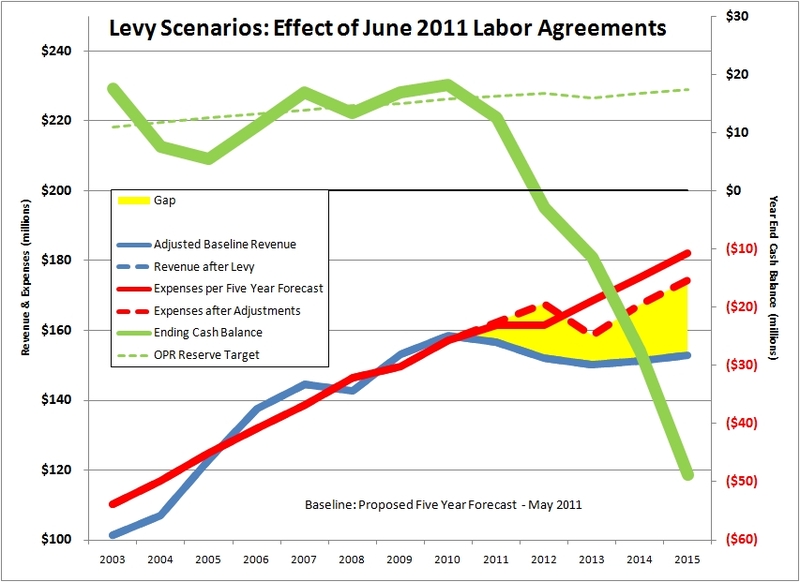 We still have to settle on the levy size (and structure), and the rate in which will allow our spending to grow. We also need to decide what level of cash balance (call it the 'rainy day fund') we want to hold, and how quickly we want to get there. The Superintendent calls our current situation a 'financial crisis.' I cringe at the use of that word - it implies "out of control" to me. It's really a decision point. We have to decide how to twist the four control knobs. For those who want to go after the rate of spending growth, I'll suggest that the teachers and staff have done their part by agreeing to go three more years without base pay increases. That means that to further cut the rate of spending growth means reducing headcount (ie layoffs), which requires cutting programs and services. The common refrain is "Cut program X (which I don't care about), but retain program Y because it's important to me." If you think this problem is easy, just observe all the people who have showed up to object about the cuts after the failure of the levy in May. As I said, every program and service has its constituency. Or we can leave the rate of spending growth as forecasted, and pass a levy big enough to support it. Or we can keep defeating levies and watch one of the top school districts in Ohio get disemboweled one program at a time. There's only one stake in the ground right now: 3 years to the next levy. What do you feel about the other three? The Hilliard School Board will be holding its annual planning Retreat next week, starting with a 6pm session on Thursday June 23, and continuing into another session on Friday June 24, starting at 8am. Because of this meeting, the regular Board meeting scheduled for June 27 has been cancelled. This will be my second Retreat as a Board member, although I observed the Retreats in 2008 and 2009 as a member of the public, making this the fourth in which I have been present (you are welcome to attend as well). This Retreat has to be different than the prior three. When we were asked by President Doug Maggied for suggestions as to agenda items for this retreat, I asked that the focus of this retreat be on strategy, and in particular, the financial component of our strategic plan. In past years, the bulk of the time has been allocated to briefings given by the department heads. It is good to know this information, but I look at it this way - our District is performing well in all aspects: academics, performing arts and athletics. That's an indication that our appointed leadership is doing a pretty good job delivering what we asked. The critical questions this year have to do with funding and spending - in other words, the financial situation. On the funding side, we've taken a whack from the State of Ohio. We knew it was coming, and it didn't matter who was elected as Governor, or who controls the General Assembly, the State has the same problem as every other government that has an revenue stream sensitive to personal and corporate income taxes - a sudden drop in revenue. Some say that our State government does three things: educate, medicate and incarcerate. If the State government is going to balance its budget - and by law it must - the bulk of the cuts were going to come from public education, Medicaid and our prison system. And since the bulk of the State's funding of public education is via direct grants to local school districts, we shouldn't be surprised that this is where the cuts were made. Nor should we be surprised that the funding cuts were disproportionately loaded onto the most affluent districts, which we are in the eyes of the State Board of Education. Not counting the one-time Federal stimulus money that was doled out via the States, our State funding will be $7.5m lower in FY12 than it was in FY09. That's not an insignificant amount of money. Had it not been for the one-time Federal funding, and the decision to drain our piggy bank (our cash reserves), the impact of these cuts would have been felt a couple of years ago. Now, with the one-time Federal money running out, we finally have to face this State funding reality. However, this new Five Year Forecast was constructed by portraying massive spending cuts in FY12-FY15, totaling nearly $45 million dollars. Making cuts of that magnitude AFTER the teachers and staff have already made major concessions would be difficult, to say the least. And so we're at the point I've always said we would get to. If we want to keep the programming and services which are most important to the people of the community, we're going to need more revenue. I support placing a levy on the November ballot. The only questions are the structure, the size and the desired interval to the next levy. As I wrote back in April, these choices represent two of the four knobs we can turn. Still, there's no way we're going to make up this budget gap with new taxes - it would take levies on the order of 5.5 mills every 3 years to produce the level of funding necessary keep our cash balance above zero through FY15. We're also going to have to take a hard look at programming and services - the third of the four budget knobs. I'm just beginning my examination of data (thanks to Justin Gardner for sharing data he had requested from the District) regarding class offerings at the secondary level, but I suspect that we'll have to take a look at the breadth of subjects we offer, especially those which attract small numbers of students. By the way, folks have frequently mentioned the "Global Gourmet" course offered in our high schools, citing it as an example of misspent resources. You might be interested to know that this is a very popular class, with 15 sections across the three high schools, serving 529 students, an average of 35 per class. We might debate as to whether we should be spending the money to offer such a class, but it is certainly in demand. We also must use care when examining this kind of data. For example, "Photography 3" is offered in all three high schools, in a total of 6 sections with a total of 13 students enrolled. It would be easy to say "let's just drop Photography 3 from the curriculum," except that a closer examination of the data shows that Photography 3 is combined in the same classrooms, with the same teachers as Photography 2, making the average number of kids in each section more like 16. The cost of labor is the product of the average compensation of the employees and the total number who are employed. The new labor agreements addressed the first component, and it is much appreciated. Now we're going to have to start looking at the second component: the total number who are employed. But I think we should do that by first making a pass through the course offerings at the secondary level, and seeing if there are some things we can do without. Certainly every subject has its constituency, driven in part by the importance of the subject matter to our kid's education, and also by the respect and friendship which is developed in regard to the teachers. This is emotionally challenging stuff, but we need to take a look nonetheless. There's no way the School Board has the training or time to look through all this data and make decisions, nor should it. It is the function of the Administration to execute policy created by the Board. So we may need some new policies in regard to academic offerings. Perhaps those policies will sound something like "Elective Courses at the secondary level will be offered only when there are at least 20 students enrolled in each section." - Let's say that we want the size of each class to average 25. That says that at any given time, the 4,600 students would be distributed over 184 classes. - Another way to look at it is that these 4,600 students have 7 academic periods each day. That means at least 32,200 "seats" have to be available. If each section provides 25 seats, then we need 1,288 sections of classes to be offered, or 184 sections each period. - So regardless of which calculation path one uses, we need at minimum of 62 teachers in each high school to lead classrooms of 25 kids each. So how many do we actually have? I don't know. And I won't try to go any further in this analysis without learning a lot more from our leadership team. All my calculations do is discover the absolute minimum number of high school teachers we need to operate with every classroom at 25 kids. I'm confident that it's not practically possible to operate with a teaching staff that small - there's always going to be some classes we'll generally agree are desirable to have in our curriculum, but few kids will take. In the end, we as a community will need to decide how much more than the required basics we're going to offer, and how much we're willing to spend to offer them competently. That will have to be balanced by what we think it does to our personal net worth, which I think is simply a function of the amount of cash we pay out in taxes versus the impact on the selling price of our homes. Some of us will stay in our current homes until we die. The eventual selling price of our home is far less important than the affordability of our property taxes. I might be one of these people - retired and living off our savings. Every tax increase is painful. But most of us will someday sell our home, and its selling price will be significantly influenced by the value a potential buyer puts on the school district. That's the reason a home in Upper Arlington is generally valued at about 25% more than a comparable home in Hilliard. Many things make a school district desirable. For some it is the academics, measured mostly in the success their kids have gaining admission to highly respected universities. For others it is the athletics, and even though few win athletic scholarships, the experience is felt to be very important for its character-building element. Other value the performing arts, which has both academic and team membership benefits. Others desire particular demographics - or rather to avoid diversity - a darker side of our nature. Whatever the criteria, once the gleam is lost on a school district, it's hard to recover. There are a number of Central Ohio school districts which were once well regarded, but are not so much so any more. It's hard to say which came first, a change in demographics (e.g. Columbus during the 'White Flight' of the 80s) or a decline in resources (e.g. Groveport-Madison when Rickenbacker AFB was closed). Our task is to keep our school district one of high regard, yet reasonably affordable. It won't be easy, and will require a lot of dialog and compromise. Please engage in the process. At a special School Board Meeting scheduled for 5pm on Monday June 6, 2011 at the Central Office Annex, the Board will be voting on a resolution to accept tentative agreements with both the Hilliard Education Association (HEA) and Local #310 of the Ohio Association of Public School Employees (OAPSE), which are the two unions representing the employees of our school district. Barring some unforeseen complication, I'll be voting in favor of accepting these agreements on behalf of our community. Here are links to the new agreements: HEA and OAPSE. Ohio law prohibits a school district from signing a multi-year agreement which spans years in which the Five Year Forecast shows a cash deficit. 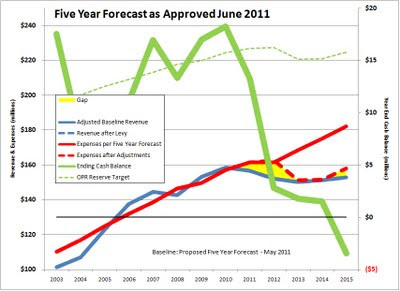 Consequently, a new Five Year Forecast has been prepared by Treasurer Brian Wilson, and it looks substantially the same as the Five Year Forecast approved by the School Board at our last meeting, except with some large, unspecified spending cuts shown in FY13-FY14. Barring unforeseen complications, I'll be voting in favor of accepting this Five Year Forecast. So, it would be fair for you to ask why - less than two weeks ago - I voted against accepting the Five Year Forecast presented then, but intend to vote in favor of this version of the Forecast. It's for practical reasons. 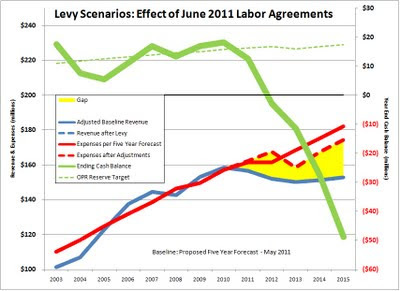 In order to sign the new union agreements, we need to play games with the Five Year Forecast. Except it's not a game. The numbers that get loaded into the Five Year Forecast as the unspecified spending cuts are real. They're just not specific - that is, they won't specify exactly what would be cut to balance the budget. But they represent the size of the gap between funding and spending in future years, and we'll have to close that gap somehow. 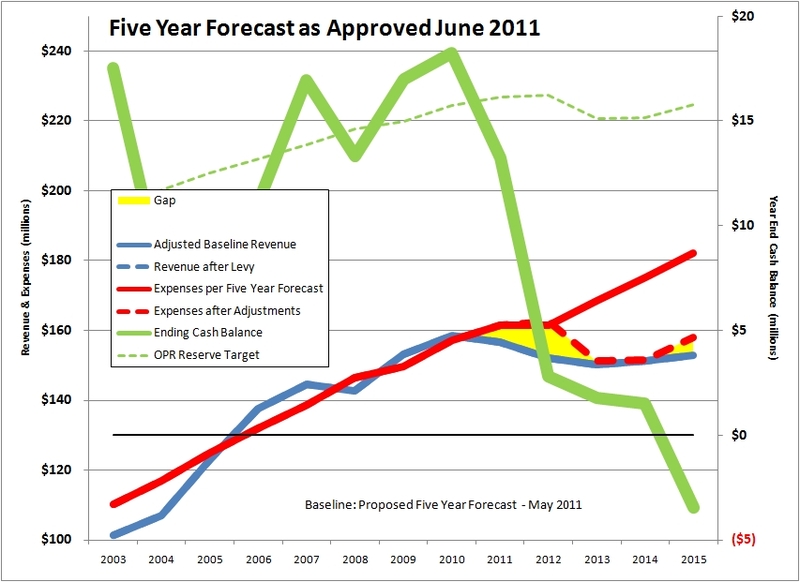 Nor does this new Forecast reflect any new revenue which might result from the passage of a levy. Again, Ohio law prohibits showing projections for future local tax revenue that hasn't yet been passed by the voters of our community. Both of those things still need to be discussed: how much more money we're willing to invest in our school district over the next several years, and what programs and services we wish to offer. I hope you are willing to engage in the dialog. The teachers and support staff took a crucial step in the process, and again I thank them for it. Now it's the community's turn.